Most everyone has heard of Aspen, known for its physical beauty, great access to skiing, high-end resorts, and home to innovative think tanks and institutes. Yet just a ½ hour drive north on I-82 will take you to Basalt, a mile-high jewel of the Rockies. 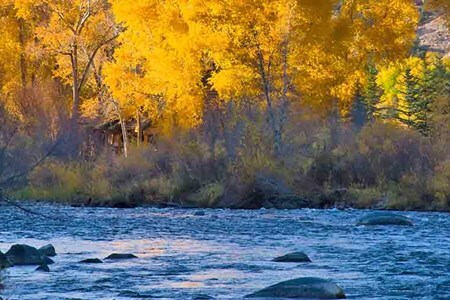 Surrounded on all sides by the White River National Forest, Basalt is also where two of the state’s best fly fishing rivers come together – the Gold Medal Frying Pan and Gold Medal Roaring Fork – and it’s a mere 30 minutes to the Colorado River. 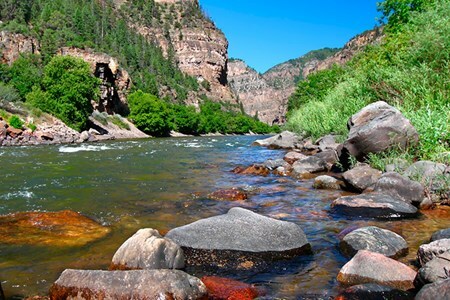 Take a wade trip on one of the West's most iconic rivers. 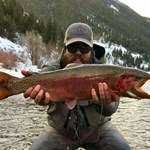 Frying Pan Anglers, located near several top Colorado fisheries knows where the fish are biting. 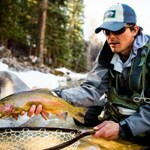 Let them be your guide to ... moremaster fly fishing on the Colorado. 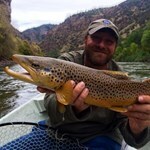 Book an incredible fishing trip on the Colorado River with Frying Pan Anglers. 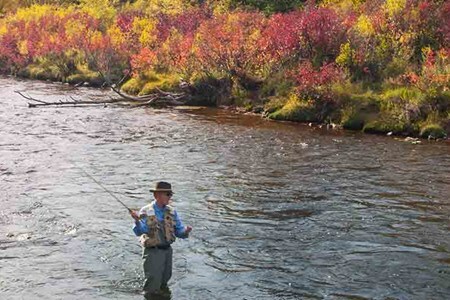 The Colorado is teeming with trout and Frying Pan Anglers will show you where to catch them. 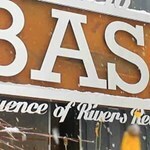 Book a trip on one of Colorado's finest fly fishing rivers, located near Basalt Colorado. 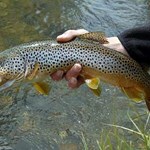 The Roaring Fork river is known for fiesty trout and lots of them. 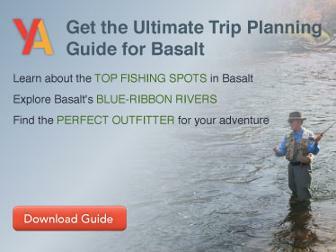 Schedule an experienced ... moreguide to show you the hot spots on the river and help you reel in a great catch! Float Trip on the Roaring Fork River in Colorado The Fork topped out near 880cfs at the beginning of the week but has been falling all week due to the cooler weather. The Fork offers ... moresome good fishing higher up above Basalt at the moment but as soon as the temperatures increase the flow will pick up again. So keep you eye on the temperatures for an indication of the rate at which the melt will pick up again. 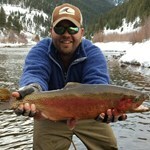 Frying Pan River Wade Trip in Colorado The Pan is OK at the moment with good water conditions. 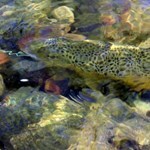 The fish are still laying low but there were reports of reasonable fishing closer to ... morethe Dam. Note that from the 3rd of June it is anticipated that the releases will be up with the endangered fish program. The Pan will run high for about a week. When the water comes up it won't be good fishing for a day or so, but when it settles down to a consistent flow it will be good fishing close to the dam where there will be floods of mysis shrimp coming through. The remainder of the river will be hard to negotiate for the few days when it runs at its highest level. Recommended Flies:Use midges, bwos, nymphs and attractors. The fish are also taking small nymphs. For mysis at the dam use Mike's Mysis. epoxy mysis, and BDV mysis. The midges will come off during the day, particularly if it is sunny. So try Wilson's Reverse Candy Cane #20, red and black chironocones #20, nick's larva in miracle pink, olive, and purple back, brassies #18 - #22, midge larva patterns #18 - #22,copper johns #18 - #22, rainbow warriors, black polywings #18 - #22 and bling midges # 18 - #22. As they come off try the gray loopwing emergers #20 - #22, the FPA special emergers, biot emergers both with and without the trailing shuck and gray RS2's#18 - #22, Johnny Flash in Olive, Grey, and Black, Olive and Red Jujubee, trailing shuck midge black and cream. In addition try dry patterns such as the z-wing real midge, black cdc midge and any similar dry black and gray patterns in sizes from #20 through to #26. The fish are taking generic nymphs such as pheasant tails and caddis larvapatterns. The BWO's are coming off as well. Try emerger patterns such as rs2'sand WD-50's. For BWO naturals use standard BWO's, parachute BWO's, parachute Adams, and Thorax patterns. Frying Pan River Float Trip in Colorado The Pan is OK at the moment with good water conditions. The fish are still laying low but there were reports of reasonable fishing closer to ... morethe Dam. Note that from the 3rd of June it is anticipated that the releases will be up with the endangered fish program. The Pan will run high for about a week. When the water comes up it won't be good fishing for a day or so, but when it settles down to a consistent flow it will be good fishing close to the dam where there will be floods of mysis shrimp coming through. The remainder of the river will be hard to negotiate for the few days when it runs at its highest level. For BWO naturals use standard BWO's, parachute BWO's, parachute Adams, andThorax patterns. A well kept secret, the Eagle River, once desecrated by mining waste, is now a restored, healthy and great place to fish. This freestone river starts its journey at over 10,000 feet ... moreon the west side of the Continental Divide near Tennessee Pass. 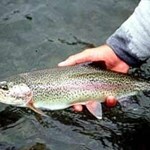 During its first 25 miles it drops over 2,400 vertical feet and can only be fished by wading. The first access site is near Camp Hale, famous for training the 10th Mt. Division during WWII, where it is surrounded by scenic Alpine meadows. Here the river is a near-perfect, brown trout habitat with fast water and numerous pockets. 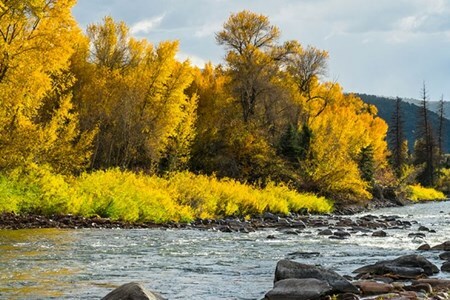 Named by the Ute Indians, who compared the river’s many branches and streams to the feathers of an eagle’s tail, the river flows northward through the Vail Valley until it is joined by Gore Creek near the town of Minturn. At this point the river turns west and basically follows I-70 until it meets up with the Colorado River in Dotsero. Although the entire river can be waded, because it is a freestone river, water levels can vary considerably throughout the year and conditions can be challenging. Strong currents are frequent as are swirling, invisible teacups. Slick rocks line the river bottom, often described by Eagle River vets as “greased bowling balls.” Before entering, you might consider bringing studded wading boots and/or wading staffs as well as obtaining up-to-date stream flow data. 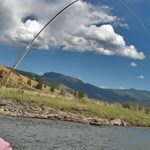 The lower portion of the river from Minturn down can be floated in a drift boat, although going with a guide who knows the waters is also worth considering. Given that there are several privately owned sections of the river, a boat will give you entry to waters you might otherwise miss. 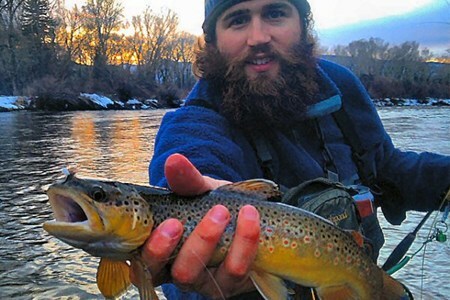 The river is not known for an abundance of fish, but both the rainbows and browns are wild and often exceed 20 inches. The limit on the lower river is 2 trout per person. Lengthy and litigated is a great way to describe this river. Starting high in the Rockies at La Poudre Pass (elevation over 10,000 feet) the river flows south and west for another ... more1450 miles before it reaches the Gulf of Mexico. Compacts, treaties and reams of legislation have determined the course of this river for the past two centuries. 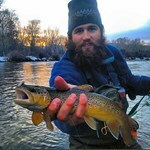 Luckily, within the state of Colorado the river remains a largely unencumbered, freestone fishery. 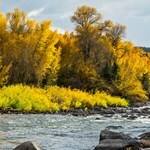 Initially, the river winds its way through the Rockies along the western slopes of the Continental Divide. The river gathers momentum as mountain streams and tributaries flow into it. Further along, it gains additional force with the confluence of the Blue, Eagle, and the Roaring Fork rivers. Its Rocky Mountain run ends after passing through De Beque Canyon and opens into the agricultural flats of the Grand Valley. Here it meets with one of its largest tributaries, the Gunnison, at Grand Junction. 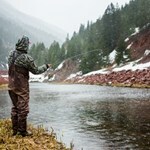 A short drive from Basalt to Glenwood Springs will get you to great trout waters. 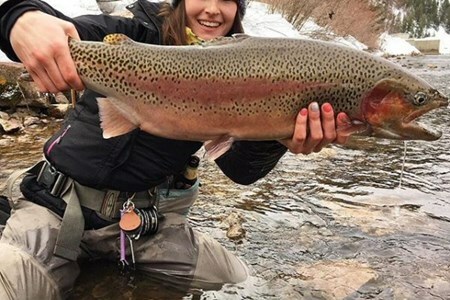 At this point, its pocketwaters, rifles and pools are flush with rainbows and sizeable browns, ranging from 13 to 20 inches. 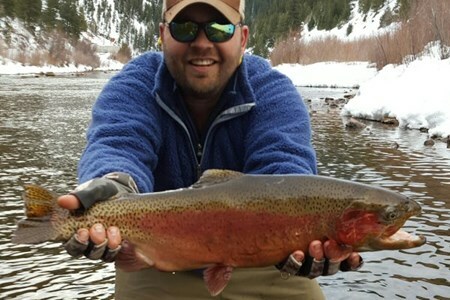 Guides and experienced anglers will tell you that the bows and browns here are among the toughest to catch in the state, surely an enticing invitation to fishermen who enjoy a challenge. Cutthroat and brook are said to be easier to catch and can be found in limited numbers a bit farther north, closer to its headwaters. While indigenous people have lived along the river for thousands of years, it wasn’t until after 1846, when the Americans won the war with Mexico, that new-world explorers began to fully appreciate the full course and commercial importance of the river. In fact, it took until 1869 for an American explorer, J.W. Powell, to actually run the rapids of through the entire Grand Canyon. Now of course, the Colorado is the main source of water for millions of westerners. 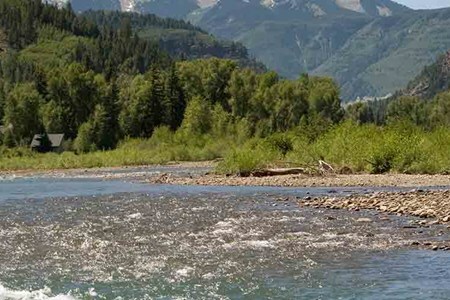 If you are an angler traveling with friends and family that aren’t that enthusiastic about fishing, the river provides a wide variety of recreational opportunities from wilderness hiking to river rafting and other outdoor sports. With a name like this you know there has to be a story. In fact there are several, but our favorite is the most obvious – that long ago there were so many fish (native cutthroat) they ... morejumped right out of the river and into your frying pan. It begins near Mt. Elbert as a stream fed, heavily pocketed, freestone river. From there the river turns northwest and flows into the Ruedi Reservoir, where since 1968, its waters have been dammed. This 14 mile, Gold Medal, section - from the reservoir to the Roaring Fork at Basalt - is considered one of the state’s best tailwaters. 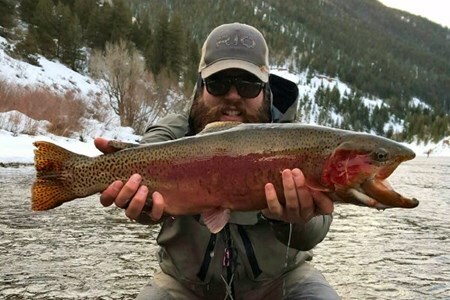 By definition, Gold Medal in Colorado means the fish are plentiful – a minimum of 60 pounds of trout per acre with at least 12 fish over 14 inches in length. Together with the designated 28 miles of Roaring Fork water, this is the longest, continuous Gold Medal run in Colorado. The introduction of the dam brought an unintended side effect when Mysis shrimp were introduced into the Reservoir to support a Kokanee salmon fishery that was never completed. The result – big boys, pigs, hogs, giants, or whatever you call them - the shrimp diet produces monster fish. Add abundant, year round hatches and it’s no wonder anglers flock here to fish. The Frying Pan is known for its fabled Green Drake hatch that typically starts in late July and extends through October, drawing even the savviest fish to the surface. In addition to Spring Blue Winged Olive (BWO) hatches, this tailwater is one of only three that hosts the Serratella ignitia, a flightless BWO that attracts fish like ice cream attracts kids. The river above the reservoir is less crowded and less regulated. The Gold Medal run is catch and release, artificial lures only. Often overlooked by visitors to the area, the Crystal is an undiscovered gem worth finding. Starting at the confluence of its north and south forks, the river winds down from the alpine ... moremeadows of the Elk Mountains above Marble, Colorado and drains into the Valley of the Coal Miners. 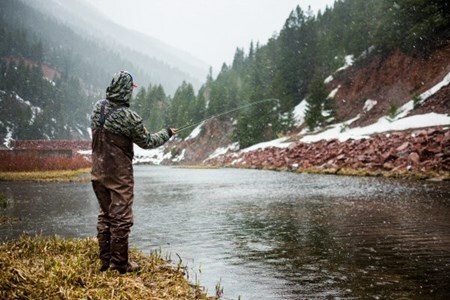 Because there are large shale deposits in its drainage basin, the “crystal” water can get muddy after a hard rain or during spring runoff, but if you catch it right it can deliver some great trout fishing. Public access is quite good since most of the river flows through the White River National Forest and runs nearly parallel to highway #133. In the fall, brown trout come up from the Roaring Fork River to spawn, which can provide a great opportunity for anglers. 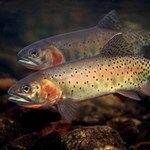 The state stocks rainbow and cutthroat in the public sections between Marble and Redstone because hatches tend to be lower here than in other parts of the river. This is the only section that is stocked. 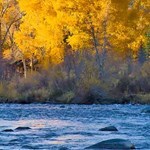 Higher concentrations of rainbow are found as you move toward the river’s confluence with the Roaring Fork. Because this is a swift moving river, the fish are known to hold out in current seams and banks where it’s possible for them to feed without exerting too much energy. 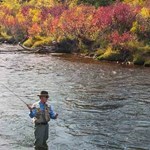 Most consider late spring to early fall the best time to fish this wading river. Between Crystal City and Marble, the river works its way through the Crystal River Canyon, a narrow valley with a challenging landscape. Fishing is known to be good here but the terrain is rugged and access is difficult due to seasonal mudslides, snow slides and rockfalls. If this type of adventure appeals to you, be sure to only go in with an appropriate, 4 wheel vehicle. 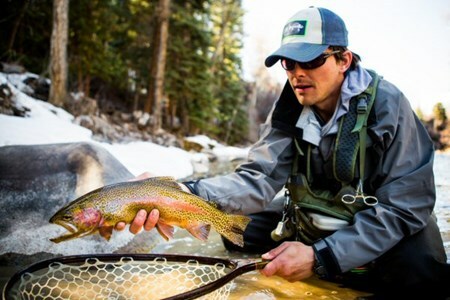 As a tributary of the Colorado, and the Frying Pan and Crystal as its main tributaries, it’s no wonder that large stretches of the Roaring Fork are ranked as Wild Trout and Gold Medal ... morefisheries. Originating high on the western edge of the Continental Divide near Independence Pass, this steep gradient river is aptly named. 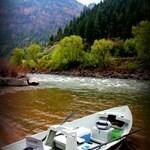 During its 70 mile run, the river drops over 7,000 feet, generating speed, turbulence and Class I to VI rapids. The Roaring Fork Watershed is vast, draining over 1,450 square miles, an area comparable in size to Rhode Island. 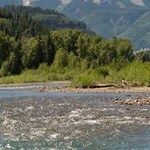 Above Aspen, the upper waters can be waded and are flush with brown and rainbow trout. Located in the White River National Forest public access is plentiful and well marked. 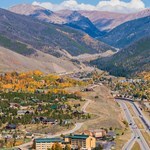 The distance between Aspen to Carbondale, a 4200 ft. drop, is a highly regarded section for fly fishers and is also easily accessed off Route 82. From Aspen to Basalt, the river loses gradient with another 1300 foot drop but picks up volume from surrounding mountain waters. Most of this section is designated as Wild Trout Water indicating that the river can support trout through an entire, natural life cycle. At Basalt the Frying Pan joins the Roaring Fork and the volume of water increases significantly. The 28 mile distance between Basalt and the confluence with the Colorado at Glenwood Springs is the famed Gold Medal run. 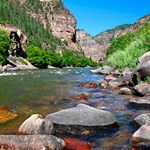 The Crystal River converges with the Fork near Carbondale and maintains the Gold medal moniker that started at Basalt. Restrictions apply in the designated waters and vary from section to section and from season to season, so it’s important to obtain current information before casting off. The Upper part of the river is good for wading. Floating is best suited for the lower stretches but requires someone experienced in whitewater navigation.